To be the successful job candidate in any field, it helps to have a comprehensive resume—even if you're only in high school. According to the Bureau of Labor Statistics, the youth labor force (16- to 24-year-olds working or actively looking for work) sharply increases between April and July each year, as high school and college students look for summer jobs. Just how many more young people are employed during those months? Consider this: From April to July 2017, the youth labor force increased by 1.9 million to 20.9 million. 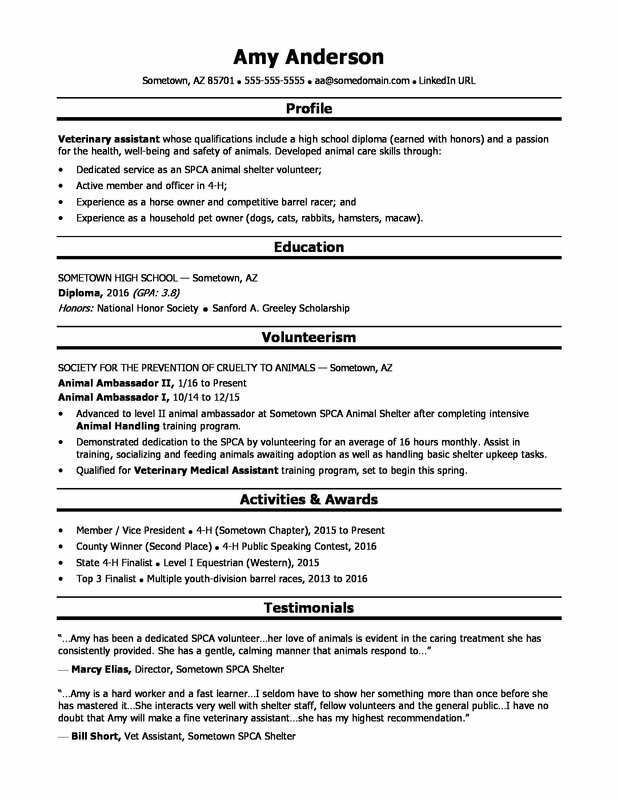 To show you how you can stand out from the crowd, take a look below at what a great resume for a high school student might look like (we chose to create a sample resume for a veterinary assistant), and download the high school grad/veterinary assistant resume template in Word. Additionally, you can learn more about animal services careers on Monster and check out our list of 25 great jobs for high school students. Experience as a household pet owner (dogs, cats, rabbits, hamsters, macaw). Advanced to level II animal ambassador at Sometown SPCA Animal Shelter after completing intensiveAnimal Handling training program. Demonstrated dedication to the SPCA by volunteering for an average of 16 hours monthly. Assist in training, socializing and feeding animals awaiting adoption as well as handling basic shelter upkeep tasks. Qualified for Veterinary Medical Assistanttraining program, set to begin this spring. Whether you worked a part-time job, volunteered, both, or neither, you can have a professional-looking resume that will position you to get hired. Could you use some help ironing out the wrinkles? Get a free resume evaluation today from the experts at Monster's Resume Writing Service. You'll get detailed feedback in two business days, including a review of your resume's appearance and content, and a prediction of a recruiter's first impression. Think of it as part of your continuing education.